Richard Kurin, the Smithsonian Institution’s Under Secretary for History, Art and Culture, will be at the Capitol Lake Visitors Center in Pierre on Monday, May 5, at 7 p.m. CDT. 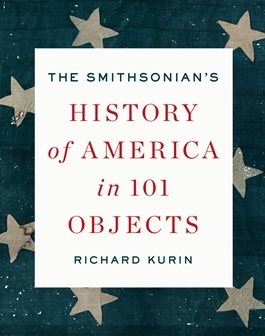 Kurin will give a presentation on his latest work, “The Smithsonian’s History of America in 101 Objects,” and will be available to sign copies of his book. Published by The Penguin Press, the 762-page book chronicles America—from prehistoric times to the present—through national treasures found in the Smithsonian’s vast collections. From Martha the last passenger pigeon, to a fragment from Plymouth Rock, to Julia Child’s kitchen, Kurin says these, along with 98 other objects, are important parts of America’s story. There will be no fee to attend the program, which is sponsored by the South Dakota State Historical Society, with the assistance of the South Dakota Historical Society Foundation, the society’s non-profit fund-raising partner. Kurin will be visiting Pierre in part because the Museum of the South Dakota State Historical Society is an Affiliate of the Smithsonian Institution. The objects selected for the book are presented in full-color photographs and paired with history, facts and often-surprising narratives that illustrate the events that shaped America. The Smithsonian houses the world’s largest collection of museum objects—137 million items, as well as more than 20 million images and recordings, and tens of millions of archival documents. “The book tries to capture the experience of visiting a treasured object in a museum with enough information about historical context and significance so as to inspire learning and curiosity in everyone,” Kurin said. The book begins 500 million years ago with fossils and archaeological objects and moves to the American Revolution, the Civil War, the Industrial Revolution and artifacts of the Depression, World War II and Cold War eras. Kurin also chose icons of pop culture (Kermit the Frog and Chuck Berry’s guitar), the civil rights movement (the Greensboro lunch counter), and items that now symbolize the digital age and the first years of the new millennium. Objects like George Washington’s portrait, the Star-Spangled Banner, Abraham Lincoln’s hat, the Wright Brothers’ Kitty Hawk Flyer, Dorothy’s ruby red slippers from The Wizard of Oz and Neil Armstrong’s space suit are well-known icons to Smithsonian visitors. Other objects are unexpected, such as Harriet Tubman’s hymnal, Sitting Bull’s drawing book, the bakelizer that cooked the first plastic and Jonas Salk’s polio vaccine. “The Smithsonian’s History of America in 101 Objects” is available for sale now at the Cultural Heritage Center. Books will also be available at the program. Other events and promotions surrounding Kurin’s visit are presently being planned by the State Historical Society. Additional information about the events will be available in the coming weeks and on the South Dakota State Historical Society’s web page at history.sd.gov. The Museum of the South Dakota State Historical Society has been a Smithsonian Affiliate since January of 2013. Kurin serves at the Smithsonian’s Under Secretary for History, Art, and Culture, responsible for many of its museums and educational programs. Trained as a cultural anthropologist, he is a former Fulbright Fellow who earned his doctorate from the University of Chicago and for two decades directed the Smithsonian’s Center for Folklife and Cultural Heritage. Kurin is the author of several books, including “Hope Diamond: The Legendary History of a Cursed Gem,” and his scholarship and museological work has been recognized by the International Council of Museums, UNESCO and Harvard’s Peabody Museum. Awarded the Smithsonian Secretary’s Gold Medal for Exceptional Service, he serves as the Smithsonian’s liaison to the President’s Committee on the Arts and Humanities, the White House Historical Association and numerous other boards. Founded in 1846, the Smithsonian Institution is the world’s largest museum and research complex, consisting of 19 museums and galleries, the National Zoological Park, nine research facilities and 20 libraries. There are 6,500 Smithsonian employees and 6,300 volunteers. Approximately 30 million people from around the world visited the Smithsonian in 2013.